Four-color process printed on Side 1 of 12pt C1S White Semi-Gloss stock. Coated with Aqueous Gloss. H1 business card slits on left pocket, with F1 flash drive slit on right pocket. 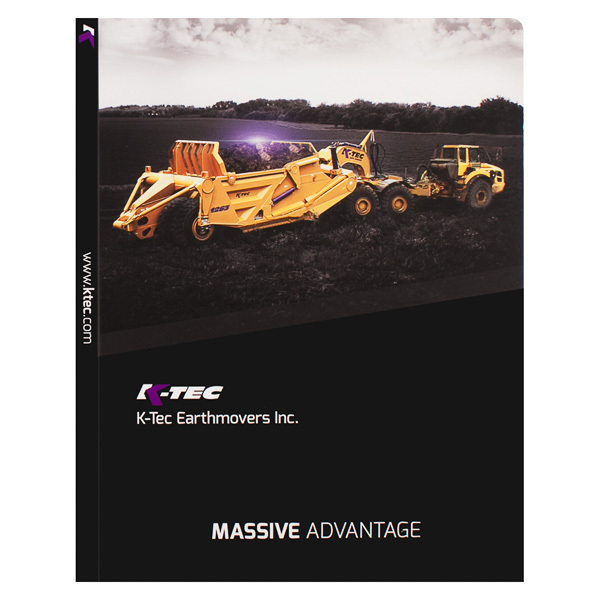 A black and gray photo acts as a backdrop to showcase K-Tec's bright yellow earthmoving equipment. Light purple accents on the black panels incorporate the brand's color. The pockets convey more information: a QR code at left and a second photo at right, which includes a pop of red to bring an intense color to the white interior. On the back cover, icons show K-Tec's purpose and benefits. Contact info appears on a product photo at the bottom to reinforce K-Tec's products one more time. Four-color process printed on Side 1 of 12pt C1S Cast Coated stock. H1 business card slits on right pocket. CFW Creative Sports, Inc.'s logo bursts into action with a collage of athletes radiating from its center. Every athlete plays a different sport and is superimposed over the others in varying shades of blue. Patches of purple blur between them, turning the individual images into a cohesive unit. The black bar that runs underneath the logo adopts the same fading effect as the illustration. On the inner right pocket, thick blue lines blur together to mimic the cover pattern. Side 1 printed with 4 PMS colors using heavy coverage on 12pt C1S White Semi-Gloss stock coated with Aqueous Gloss. H1 business card slits on right pocket. 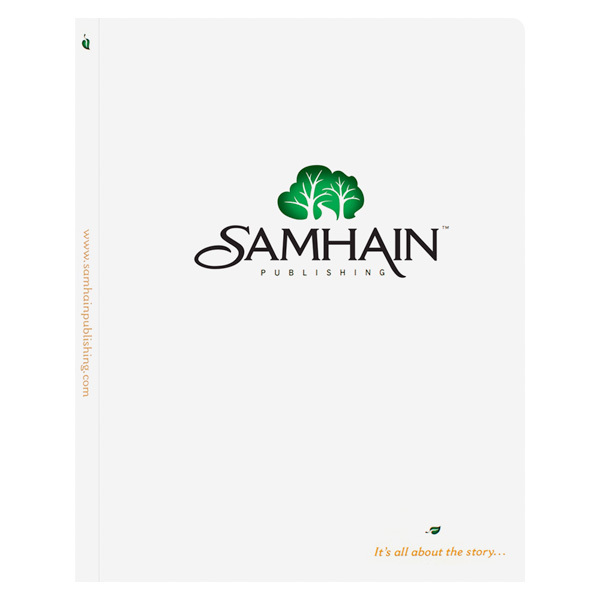 This design for Samhain Publishing focuses on nature and growth. The company logo uses negative white space to form a path between two lush, green trees. A single leaf rests above the company slogan at the bottom of the cover. Inside, green pockets stand out against the white panels. The back is a stark contrast to the cover as the company logo takes up the entire space in two shades of green. The company's website is in beige at the bottom and on the backbone of the folder. Four-color process printed on both sides. 120lb C2S Gloss stock coated with Aqueous Gloss. H1 business card slits on left pocket. One of photographer Henri Huet's most iconic images graces the cover of this design. 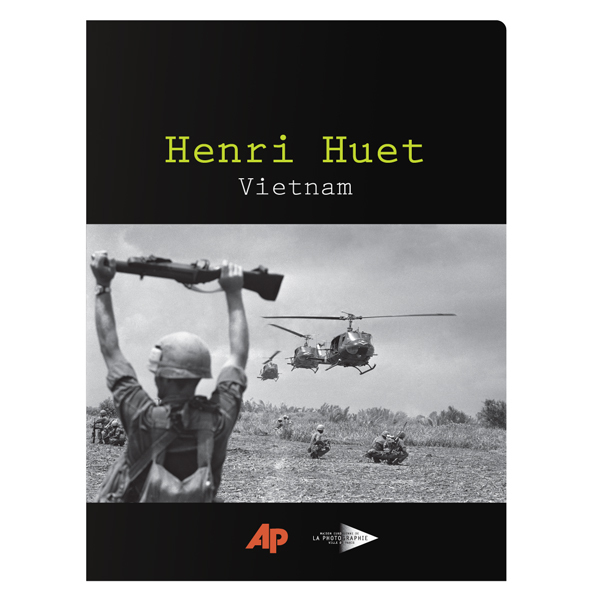 The vintage photo is part of a presentation package put together by the Associated Press, one of the world's oldest and largest news organizations, to celebrate Huet's life and to honor his work in the intense combat zones of Vietnam. Huet's name in lime green on the cover stands in striking contrast to the black background. One green and one black interior panel continue the popular 1970's color combination, which sets a retro tone circa the time in which Huet took some of his best photos. Measuring 1/2", a double-score backbone creates a roomy interior for all of your 8 1/2" x 11" print media. The added space allows the product to lay flat when carrying a large amount of paper. The exterior offers an opportunity to print your company's name or contact information along its spine, like a book's title. Two v-split pockets flex to avoid buckling when closing the cover. Rounded corners protect the exterior panels and reduce the risk of bent or dog-eared edges.